A trusted leader in exterior home improvement, Century Home Improvements by Century Spouting Co. Inc. has been providing excellent service to our clients for over 30 years. Our goal from the beginning has been to provide quality seamless spouting and gutters to our customers and neighbors on their home projects. 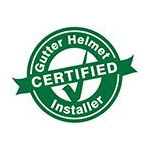 Since our establishment in 1976, we have grown and with the combination of 25 fully equipped service trucks, fully certified installers and full service for all gutter needs, we have become one of the top Gutter Helmet suppliers in the country! We have built a solid reputation as one of the nation’s top 300 home improvement firms by satisfying over 80,000 homeowners and businesses and achieving an A+ rating from the Better Business Bureau. More than 80% of our business is generated from customer referrals. We treat our customers like friends and neighbors because they are our friends and neighbors. We want to help them make their dreams come true and this desire is reflected in the work we do. Call Century Spouting Co. Inc. today at (800) 824-3772 to schedule an appointment with our Gutter Helmet experts and learn more about our products and services.